Discussion in 'Star Style' started by Meg, Jun 13, 2009. Please remember to stay on the topic of Rob's style... All off topic discussion will be removed. The old thread can be viewed here. Is that a new jacket? I don't think I've seen it before. He has such long lean legs. I know it's not his style, but I'd love to see him in skinny jeans a la Shia LaBeouf. I feel like that would be both good and bad. A lot of girls hate that style. but im all on board for that!!! agreed about the skinny jeans - he, zac efron, and shia can all pull that off really well because their legs look great in jeans. i love it, personally, but i kinda dig that he sticks to his own style, too! He really does have great hair. One day, hair cloning will be available, so many people will have hair like him I guess. But it is funny his hair looks great even if it is obviously greasy and dirty. Ahhh, to be beautiful... certainly has immense advantages! Who is that girl and where was that pic taken? but tha tpic is beautiful (apart from him wearing diarrhea jacket), although you barely see anything. you should not post "subscribing" within the thread..
Oh, my Go!! New thread?? already?? Like the las new/old pic. I'll hope we'll have more soon! I love what he is wearing, blue is definitely his colour. But about the shoes, not so much. 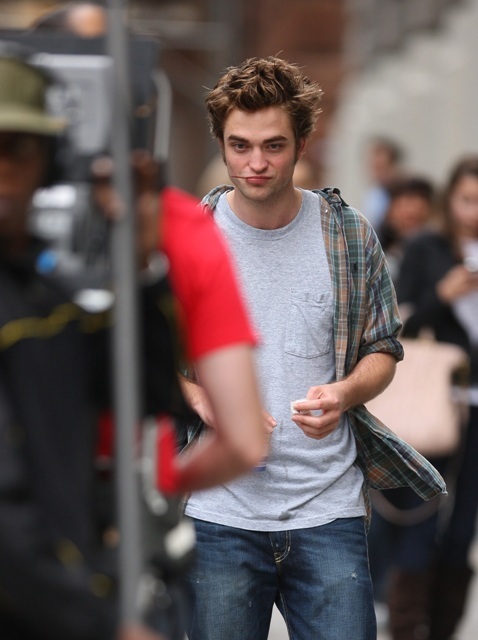 The photo captions from the agency say he’s shooting Remember Me – first day on set – in New York. Doesn’t look like the wardrobe department had to stretch. Is he wearing his own clothes? 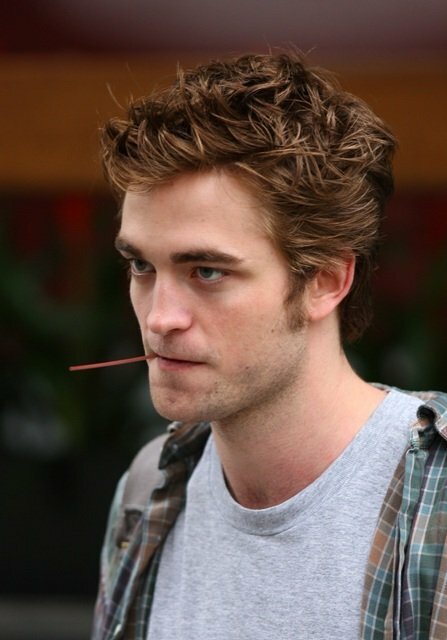 Anyway, Twi-hards were jonesing all weekend because he hadn’t been seen. Withdrawal symptoms eased by group therapy sessions in chat rooms and message board. An early Monday morning gift then. And he’s playing someone other than Edward Cullen too. Good. Anyone is an improvement. Have included some side shots of his face because of the debate that’s raging here at the office. Laura obviously thinks he’s perfect. I have always said he’s a beautiful but androgynous amoeba boy. Michelle thinks if he was a regular guy he would not be as attractive as he’s been sold to be, and Danielle says he’s downright strange looking with a smushed down side profile flat face which I can totally see as Edward because he’s constipated and tortured all the time but in real life, in real life it’s actually not so bad. love it!!!!!!!!! and YES he's totally wearing his own clothes!!!! hahaha. He really pull plaid shirt off!!!!!!!!!!!!! ^^ OMG I just checked Lainey's site and I thought they were the same bunch of pics. Turns out NOT. Hehe. There, he has no jacket and it actually looks like they're filming while the ones I posted earlier look like they're rehearsing (?). Lots more at Lainey and entertainmentwise.com which like Alvedansen, I'm too lazy to post.